Dr. Adikanda Biswal, M.S (Ay. ), PH.D. (utkal) is a lecturer at the Gopabandhu Ayurved Mahavidyalaya & Hospital, Puri-752002(Odisha). He had a brilliant career, stood first in medical officer selection board, Govt. of Odisha in 1991 & worked as Ayurved Medical Officer (A.M.O.) under Health & family welfare Deptt. Govt. of Odisha (1992-2001). He had completed Post Graduation (P.G.) in 2001 & Ph.D. (Ay.) on Shalakya Tantra (Netra Vijnanam) in 2012 from Utkal University, Bhubaneswar, Odisha. He has many publications to his credit in regional & National Level Journals. Being a teacher of ayurved presented several clinical & scientific paper in national level seminars and given several talks in radio, television. Dr. Biswal has attended several conferences , R.O.T.P., C.M.E. programmes in different ayurved colleges in India. Dr. (Mrs.) Rasmita Rautray, M.D. (Ay.) is working as Ayurved Medical Officer (A.M.O.) under Health & Family welfare Deptt. Govt. of Odisha. She had completed her Graduation [B.A. M.S. (Hons.)] in 1989 & Post Graduation (P.G.) 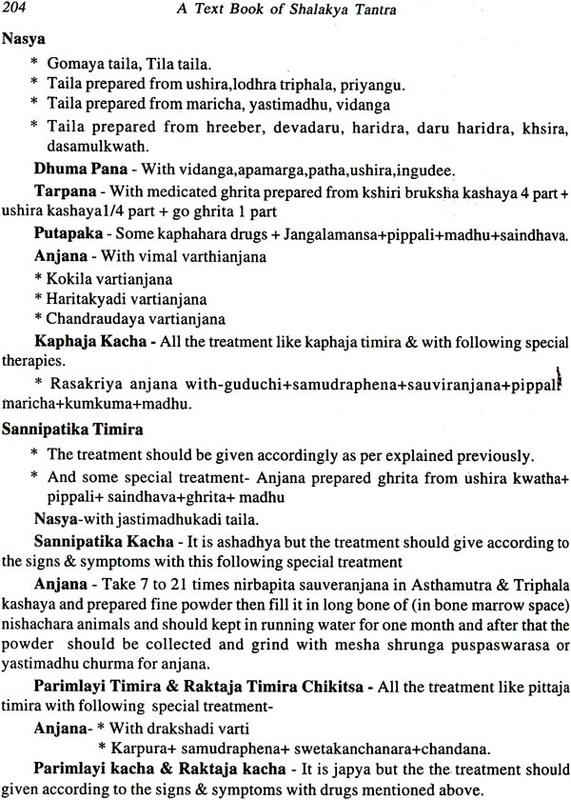 in Kayachikitsa (Panchakarma) in 1995 from Gopabandhu Ayurved Mahavidyalalya & Hospital (Puri), Utkal University, Bhubaneswar, Odisha. Her Liking in Ayurved encouraged to write this book. She had a very excellent academic career. It is my pleasure to write forward for the book' 'A Text Book of Shalakya Tantra"(Vol-I) by Dr. Adikanda Biswal & Dr. Rashmita Routray is based on the latest C.C.I.M syllabus contents of B.A.M.S degree course. Both were my best students during their graduate and postgraduate training in this institution and done exemplary work by writing the book which is appreciable. They have taken much pains to complete and collect the various scholarly commentaries and elucidate the real interpretation of the subject. I welcome and congratulate the young authors for their onerous task which they completed energetically and patiently. I hope they will continue writing more books on the subjects in future and I wish their success in all future endeavour. The eye is the mirror of the body. Any abnormal changes in organs or organ system is reflected through it. The need for a text book for B.A.M.S students in comprehensive & comparative Netravigyan dealing on the basic concepts, with modern interpretation and practical experience has been felt for a long time. Being a teacher in shalakyatantra for the last 10 years. 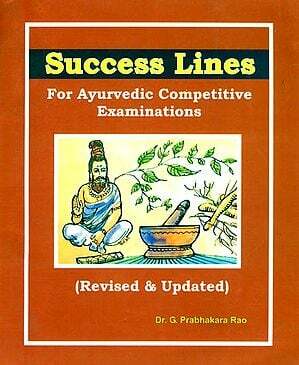 I deeply realised that the descriptions, queries & controversies in the available books are greatest hurdle for students and not digested easily keeping in mind by the blessing of "Lord Jagannath" the changed curriculum this book is in- tended primarily as a first step in commencing and continuing the study for the fundamentals of "Netravigyan" in english language. For this purpose with great help of my wife Dr. (Smt) Rasmita Routray I have gone through concerned Ayurvedic and modern literatures to get a clear idea of the subject, our clinical experiences and re-search trials have helped us very much. The individual diseases with applied anatomy, applied physiology, sagyan (definition), nidana(etiology), samprapti (pathogenesis), Lakshana (signs & symptoms) sadhya- sadhyata (prognosis), chikitsa - treatment (Veshaja, shastra etc.) both ancient & modern correlation / interpretation are described in such a way that a B .A.M.S student, researcher, practitioner and concerned teacher can easily approach the case with confidence. There were hurdles during the work, but by the grace of our Parents there were helping hands from various sources. First of all we express our loving thanks to our daughters Chandanakshi, Sunandakshi & Anandakshi for their whole hearted support and encouragement. We are especially thankful to our students Dr. Natabar Chand, Sri Satrujit Kalsai, Dr. Budhadeba Mishra, Dr. Ram &: Dr. Swarup for their various helps time to time. Aim - The main objectives of this book is to provide the BAMS students with a clear, comprehensive comparative systematic and logical presentation of the Netra Rogas as per the curriculum on the basis of the latest C.C.I.M syllabus. Style - This book follow an informal interactive style, so that students will find it appreciative and easy to understand. The important definition, statements, references are set in bold letters. lllustration- More than 40 illustrative diagrams and - colourful photographs are given. 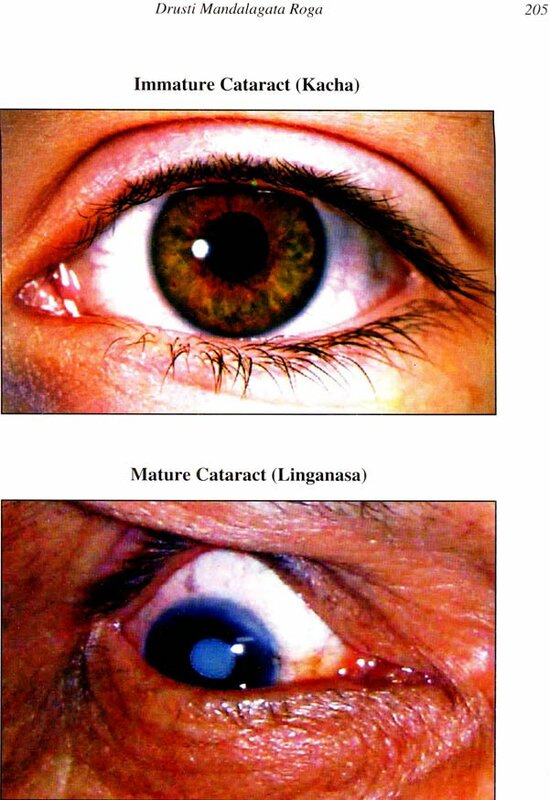 •Different ophthalmic treatment procedures with their scientific interpretations, occular therapeutics and so many ophthalmic drugs (herbal, mineral & animal products) with their latin name, action, use in different diseases given in separate chapter. •Examination method of eyediseases in both Ayurvedic & Modern methodology are described. •Students are always our inspiration so constructive criticism and suggestions are always welcome. They will help us to improve the future editions. •In this moment we remember all our teachers, whose blessings have given us knowledge and power. •We hope our fellow teacher and the students for whom this book has been prepared will find useful both teaching and clinical. It is my pleasure to write forward for the book' 'A Text Book of Shalakya Tantra" Vol-II (Ayurvedic Orthinolaryngology and Dentistry) by Dr. Adikanda Biswal & Dr. Rashmita Routray is based on the latest C.C.I.M syllabus contents of B.A.M.S degree course. Both were bonafide students during their Graduate, Postgraduate and Ph.D training in this institution and done exemplary work by writing the book in english which is appreciable. 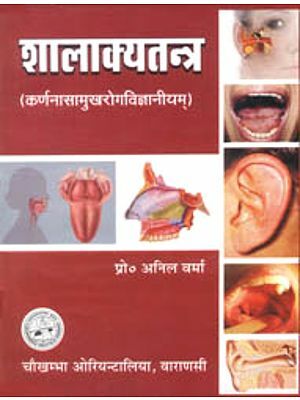 The need for a text book for B.A.M.S Students in comprehensive and comparative "Karna, Nasa, Shiro and Mukha rogas" (Ayurvedic Otorhinolaryngology and Dentistry) dealing on the basic concepts, with modern interpretation and practical experience has been felt for a long time .Being a teacher in Shalakya Tantra for the last 12years .I deeply realise that the description, queries and controversies in the available books are greatest hurdle for students and not digested easily. Keeping in mind by the blessings of "lord Jagannath "the changed curriculum this book is in-tended primarily as a first step in commencing and continuing the study for the fundamentals of "Shalakya Tantra Vol-II Kama, Nasa, Shiro and Mukha rogas" in english language. For this purpose with great help of my wife Dr. (Smt) Rasmita Routray, I have gone throw concerned Ayurvedic and Modern Literatures to get a clear idea of the subject , our clinical experience and research trial have helped us very much the individual diseases with applied anatomy, physiology, definition, etiology, pathogenesis, signs & symptoms, prognosis and treatment both ancient and modern correlation / interpretation are described in such a way that a B.A.M.S student, P.G. Scholars of Shalakya Tantra , Practitioner and concerned teachers can easily approach the case with confidence. There were hurdles during the work, but by the grace of our parents and with helping hands from various sources we were able to completed this project .First of all we express our loving thanks to our daughters Chandanakshi, Sunandakshi and Anandakshi for their whole hearted support and encouragement .We are especially thankful to our students Jagannath , Sibananda, Kamalakanta, Arunima, Dr. Sweta, Dr. Tapoi, Dr. Sujata, Dr. Jogeswari, and Dr. Namrata for their various helps time to time. Aim- The main objectives of this book is to provide the clear, comprehensive, comparative, systematic, and logical presentation of Kama, Nasa, Shiro and Mukha rogas to the B.A.M.S students, as per the curriculum on the basis of the latest C.C.I.M syllabus. Style-This book follow an informal interactive style, so that students will find it appreciative and easy to understand; the important definition, statements are set in bold letters. Illustration -More than 30 illustrative diagrams, 20 tables and colourful photo graphs are given. Summary-Examination method of ear, nose, paranasal sinuses, oral cavity, teeth and throat etc. 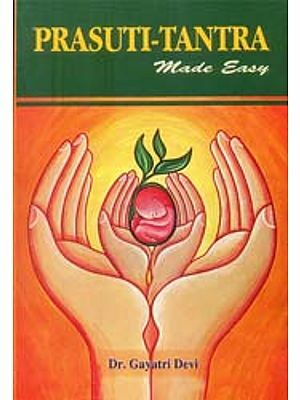 in both Ayurvedic and Modern methodology are described and authoritative references from Ayurvedic texts are given. Chapter end- A brief and brisk of the whole chapter at a glance in tabular form at the end of each chapter are given which helps the students quick revision before the examination. Conclusion - Students are always our inspiration so constructive criticism and suggestions are always welcome. They will help us to improve the future editions. In this moment we remember all our teachers and seniors whose blessings have given us knowledge and power.